In a parallelogram; opposite sides are equal, opposite angles are equal and diagonals bisect each other. (iii) diagonals bisect each other. Let PQRS be a parallelogram. Draw its diagonal PR. ⇒ PQ = RS, QR = SP and ∠Q = ∠S. Thus, PQ = RS, QR = SP, ∠Q = ∠S and ∠P = ∠R. In order to prove (iii) consider parallelogram PQRS and draw its diagonals PR and QS, intersecting each other at O. ⇒ OP = OR and OQ = OS. This shows that the diagonals of a parallelogram bisect each other. 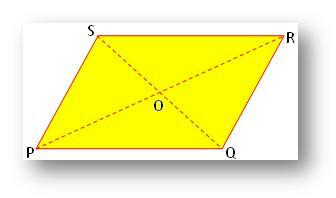 (i) If the opposite sides of a quadrilateral are equal then it is a parallelogram. (i) If the opposite angles of a quadrilateral are equal then it is a parallelogram. 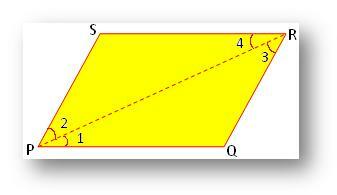 (i) If the diagonals of a quadrilateral bisect each other then it is a parallelogram.